Eva krbdk is a talented turkish tattoer based in Istanbul. The tattoo community is taken by storm simply beacause of Eva's awesome and unique style. Her clever designs look like a mix between pixel art and the popular folk art they are named after, creating something truly one-of-a-kind. Eva creates her tattoos with vast assortment of designs and colours to make each tattoo distinct. 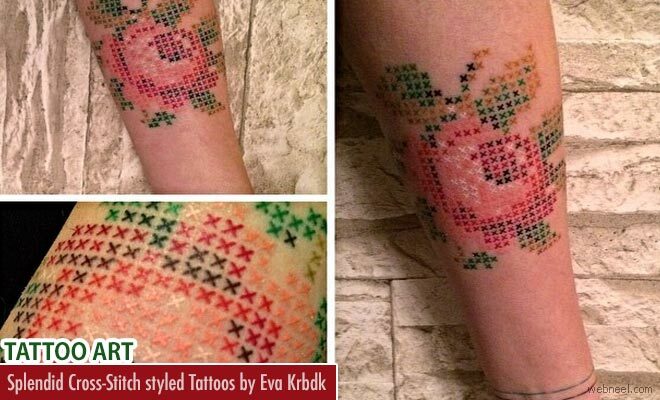 Not only cross-stitch tattoos, Eva spreads her talent in various styles of tattoos and designs. With her simple and small designs to larger ones are cute and impressive with a blend of beautiful colours and patterns. Eva does her cross-stitching without resorting to black borders to make the shapes stand out. Eva Krbdk works in Ankara and Daft Art is her studio.